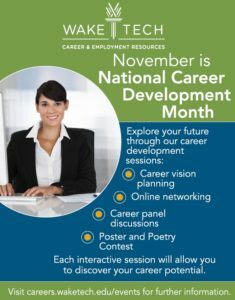 November is National Career Development Month! Are you interested in exploring your career path? Career & Employment Resources is hosting many events this month highlighting practical strategies, options and benefits to setting your career in motion. Check out our events page to register for the upcoming sessions. At every event, you have a chance to win a padfolio! Come early! Career, Employment, Interview, Leadership, Resources, Resume. permalink. ← Want to be the next Talon?? Vote Early on Southern Wake Campus! Help The Nest Win $15,000!